Two KPU Brewing students have released a signature beer called Kapoentje, which means ‘little rascal’ in Dutch. It is a Belgian Pale Ale brewed by soon-to-be grads Sacha Bordas and Luc Vreys, who also happens to be from Belgium. "While the current craft beer scene looks for innovation and the next-best-thing, I feel the world needs a quality drinking beer full of flavour and body,” says Bordas. 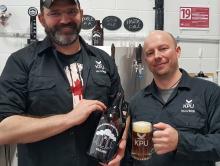 Each year, second-year KPU Brewing and Brewery Operations Diploma students are assigned a capstone project in their final semester to develop a recipe and brew their own signature beer. This year, there are a total of 10 signature beers. For Vreys, it was all about going back to the basics. “We decided to focus on making a traditional, basic beer style and do it really well. I’m from Belgium where Pilsners are common. If I wanted to drink something different at home, I went for a Belgian Pale Ale, which is why we chose to make this beer for our signature-recipe project,” he says. Kapoentje has notes of bread, malt, caramel and fruit with 5.2% ABV and 24 IBUs. The beer will be available for growler fills starting January 25 at the KPU Brew Lab brewery on the Langley campus at 20901 Langley Bypass, Langley, BC. Luc and Sacha will also be on hand this Friday from 1-6 pm to chat about their beer. The other nine beers will be released over the next three months and shared via social media on Instagram, Twitter and Facebook. For more information on the program, visit kpu.ca/brew. For a behind-the-scenes tour of KPU's teaching brewery, the next open house and information session is taking place Feb. 12, 2019 from 6:30 to 8:00 p.m. at KPU’s Langley campus (20901 Langley Bypass). The Brewing Lab is located behind the Best Western hotel, across the parking lot. The open house is free and open to the public, but registration is requested at kpu.ca/brew/open-house.